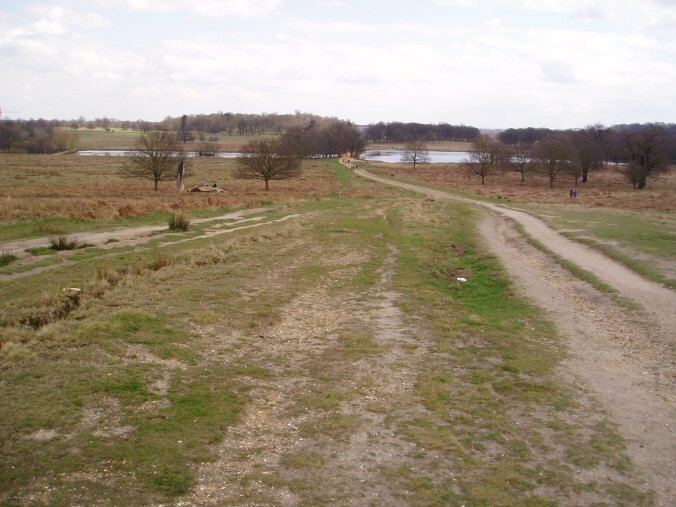 I walked this, the sixth stage of the Capital Ring on the 9th April 2006, continuing on from the fifth stage. Of the three stages I walked on the day this was by far the most enjoyable with only a couple of sections of road walking, the rest of the walk being across parks and commons down to the River Thames at Richmond. Leaving Wimbeldon Park underground station the route of the Capital Ring continues uphill along Arthur Road for a short distance and then turns right into Home Park Road. From Home Park Road the path enters Wimbledon Park, photo 1. The path passes besides the large Wimbeldon Park Lake, photo 2 and on past a small athletics stadium. Just past the stadium there was a good view back across London to the transmitter mast at Crystal Palace where I had started the days walk. A Capital Ring fingerpost, photo 3, just before the athletics stadium showed a distance of 6 1/2 miles to Richmond Bridge. From Wimbledon Park the Capital Ring heads along Wimbledon Park Road, Bathgate Road and then turns right into Queensmere Road which climbs steadily uphill to Wimbledon Park Side. 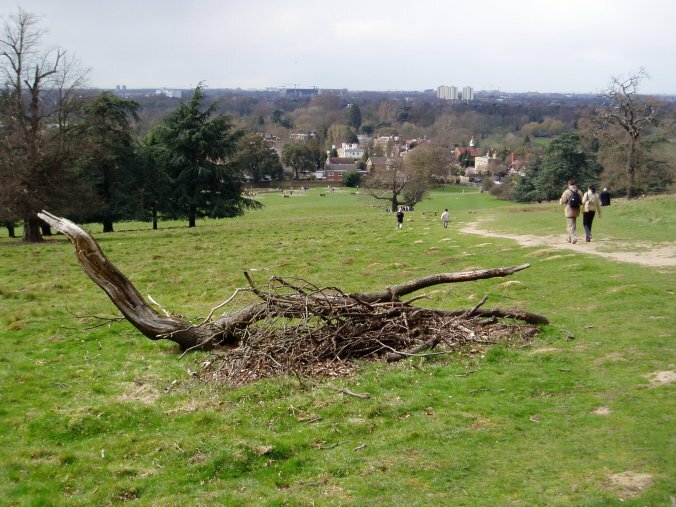 After a short walk along Wimbledon Park Side the path turns into left into Wimbledon and Putney Common, photos 4 and 5. A short distance down the track the path passes the windmill in photo 6. There is a cafe and public toilets besides the windmill which also houses a small museum. More details about the common can be found at informative Wimbledon and Putney Commons Website. The path continues through Wimbeldon Common passing the club house of the London Scottish Golf club as it makes it way downhill towards Queens Mere, photo 7. The path crosses a couple of fairways however there was no one playing golf when I went past and continues along lightly wooded paths, photo 8. Some of the trees were just beginning to show their new leaves, photo 9. Eventually the path reaches Beverly Brook, photo 10, which is followed for a short distance before the Brook is crossed and the path heads over to a footbridge over the A3, photo 11, and then crosses the A308 via a predestrian crossing. From here it is just a very short walk down Kingston Vale to where a left turn takes the path into Richmond Park, photo 12, through the Robin Hood Gate. Just inside the park I brought an ice cream and sat down on a log to eat it when for the second time during the day I was joined by a crow looking for a handout. This time the crow perched on a raised bit of the log, directly behind my right shoulder, much to the amusement of a number of passers by although it flew off when I went to get my camera out. The path crosses Richmond Park, photo 13, skirting the edge of Spankers Hill Wood before heading down between the Pen Ponds, photo 14. Passing the ponds the path heads uphill before taking a track off to the left that runs besides Sidmouth Wood, just before the brow of the hill is reached. Looking back down the hill there were good view back to the Pen Ponds across the park, photo 15. 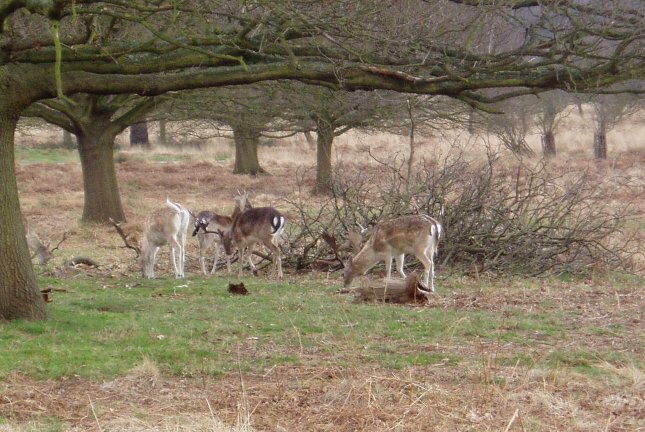 Richmond Park is home to about 650 red and Fallow deer and I spotted a couple of groups of these as I passed through the park, photo 16. Past Sidmouth Wood the path crosses a road and drops slightly downhill to skirt the gardens of Pembroke Lodge. A Capital Ring fingerpost, photo 17, close to Pembroke Lodge showed it was now just 1 1/2 miles to Richmond Bridge (and 33 miles from the Woolwich Foot tunnel). From this point there were good views across the Thames Valley and I could hear the occasional roar of the crowd in Twickenham stadium which could be seen away in the distance along with intermittent sparkle from camera flashes in the stands. London Wasps were playing Llanelli Scarlets in the 2006 Powergen Cup final in front of a crowd of 57,212, (Wasps won 26-10) hence the noise. Opposite King Henrys mound the path turns left and descends steeply down a grass covered path towards Petersham, photo 18. At the foot of the hill the Capital Ring leaves Richmond Park and crosses the A307 to head down an alleyway that runs besides a pub towards St Peters Chuch, photo 19, from where it is just a short walk down to the River Thames, photo 20. As I reached the Thames it started raining but fortunatly not too heavily. As the path heads down the river towards Richmond Bridge, photo 21, it passes a number of grand buildings on the hillside above the path. Richmond itself, which I had never visited before also had some fine waterfront buildings. 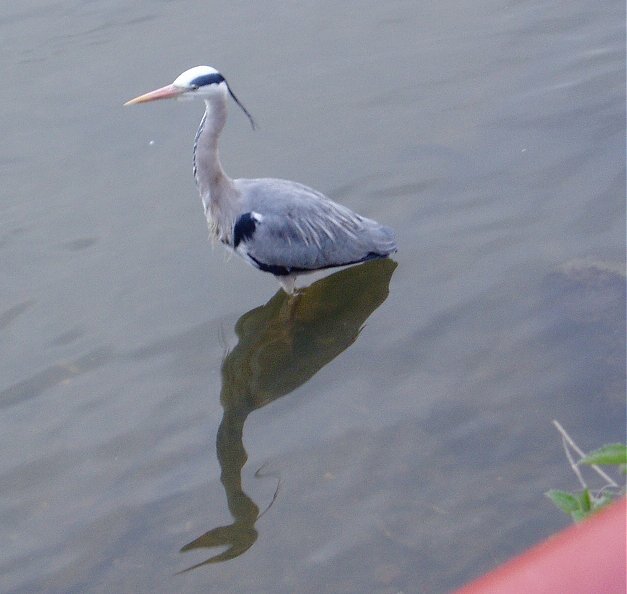 As I was passing through the centre of the town I managed to get a great picture of a heron, photo 22, which seemd remarkably unconcerned by all the people about. (Clicking the green text will display a larger version of the photo). Not far past Richmond Bridge the end of the stage is reached and I turned right up Friars Lane for the short walk past the very attractive buildings around Richmond Green to Richmond Station and the train home. The GPS made the length of this stage, including the walk to Richmond Station, 6.72 miles long and total distance walked for the day of 15.2 miles. This was significantly less than the distances shown on the Capital Ring signposts. It was however a fine walk and the best stage of the Capital Ring so far.